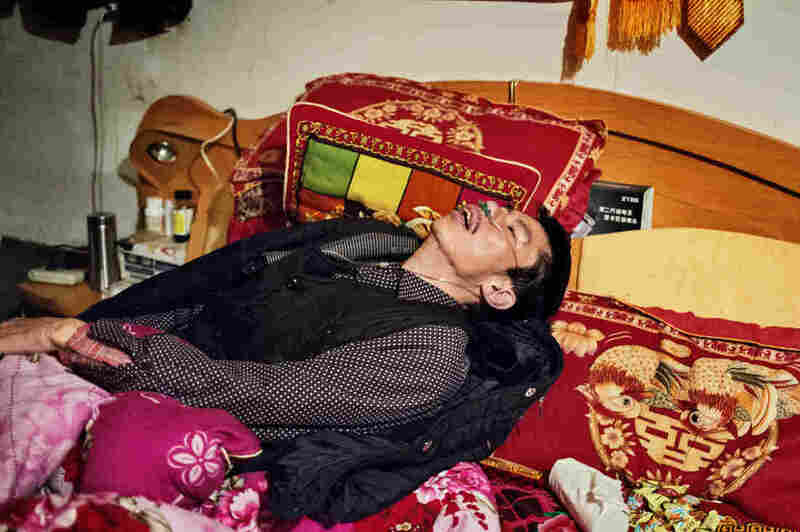 What It's Like To Take Photos Of A Dying Man : Goats and Soda Like millions of Chinese gold miners, He Quangui was stricken with the lung disease silicosis. At first he didn't want his story to be told, but over time he came to trust the photographer. Arriving at a hospital seven hours' drive from his remote village in the mountains, former gold miner He Quangui is finally put in a ward. The doctors are puncturing his chest cavity with a needle to remove air that had escaped from his damaged lungs. In pain, He Quangui tries to clasp the drip pulley hanging from the ceiling; his brother-in-law Mi Shiliang is at a loss for how to comfort him. 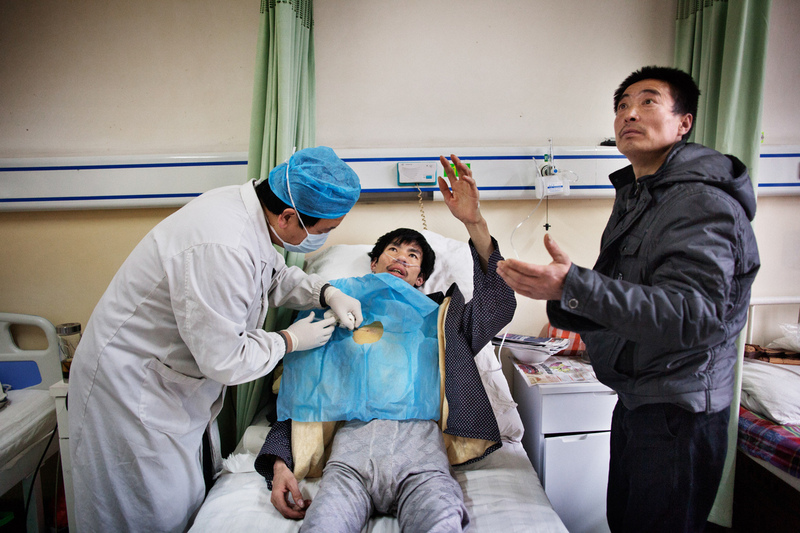 For more than 10 years, disease had slowly eaten away at He Quangui's lungs, leaving him, for the most part, bedridden. But He was no smoker — he was a Chinese gold miner. He was stricken with silicosis, a respiratory illness caused by inhaling silica dust. An estimated 6 million Chinese miners suffer from the debilitating disease pneumoconiosis — of which silicosis is one form. 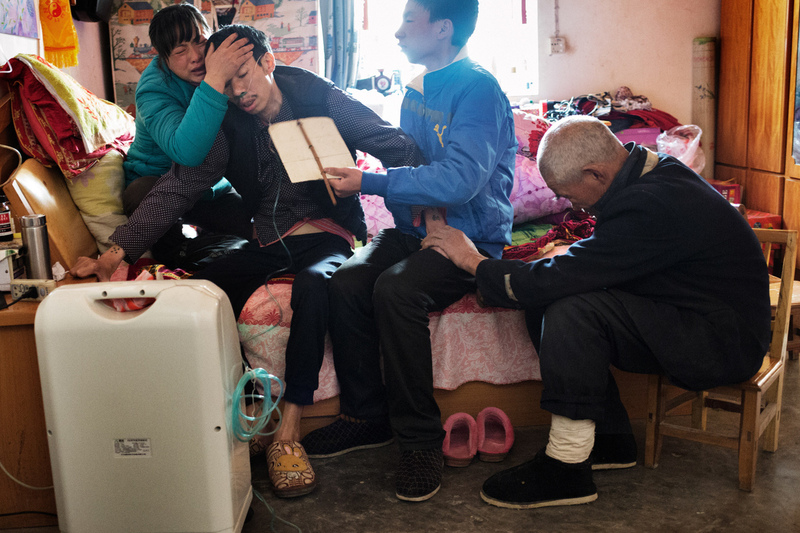 In hopes of showing people just how badly silicosis wreaks havoc on the body, Beijing-based documentary photographer and videographer Sim Chi Yin followed He for four years. She captured his dangerously thin body, his painful gasps for breath and even one of his many attempts at suicide. A short film of the heart-wrenching moments Sim documented was recently published on National Geographic's website. Why did you choose to follow He Quangui's life in particular? [He] was meant to be the source person for interviews, but when I went out to meet him, I found him to be extremely articulate. He wasn't super keen to tell me his story when I got there, but then I spent about a week just sitting around, having tea and taking some photographs. He kind of opened up after a while and I found him to be a very interesting and thoughtful character, so I stuck with him. Collapsing a second time in the same day, shortly after trying to urinate on a commode, He Quangui struggles to breathe. His son He Jingbo fans him with a piece of cardboard while his wife Mi Shixiu and father He Decheng hold him, crying. The next morning, he would try to kill himself. How long did you follow He for? Actually, when I first started out doing the story, I was not convinced that it would be a visual story. I came back from that first trip with very poor pictures because he was pretty sickly and he didn't do much. So the pictures are very undramatic — it's just him sitting around. I was actually going to put this story on the back burner. I left it alone for about six months and then, one day, my phone rang very early in the morning. It was his wife, Mi Shixui. She was wailing on the phone and she said, "He's very sick. You have to help him." Out of desperation, she had called me for help. His lungs were basically collapsing. I raised money for him through a Chinese NGO and flew up there and picked him up in a volunteer's car and drove him to the hospital. Then I spent a week with him in the hospital. That surgery prolonged his life for four years. So you actually worked to help the man you were documenting? There are people who've asked me, "Isn't this unethical? You intervening and changing the course of your story." This is total intervention, which is something we're taught not to do in objective journalism 101. But I just thought it was unconscionable not to help one's subject, given such a situation. I think all of us documentary photographers are hoping to bring about some kind of change through our photography. I think if I had just stood by and not done anything and let him die, what kind of change am I trying to bring about? I couldn't walk away from it. A shadow of himself: Former gold miner He Quangui, who has incurable silicosis from years of blasting rock in illegal mines, once weighed 65 kg (143 lb) and is now a skeletal 44kg (97 lb). He looks at himself moments after peeling himself up from bed one morning. Those photos in the hospital were very intimate. Was the family OK with you taking those? They weren't, at first, so keen on it. They didn't really understand what I was doing. But, over time, Quangui himself became a collaborator, not a subject. We became friends and he really understood. I had to repeatedly explain what I was doing and what the goal of documentary photography is. In the end, he said, "I give you full permission to photograph me." He kept saying things like, "I want to live long enough to see benefits of this story and of what you can do, but I hope I'll be able to help other people." I think it's pretty rare to get this kind of access to a Chinese family in crisis. Society is generally pretty closed and people are generally cautious and conscious. But I have a relationship with his family that is pretty close. He told me I was part of the family. And I've done more than just photography. I've helped him many different ways in his final years. Even when [He] speaks about me, he talks about me as a savior of some sort because of that intervention early on when he needed hospitalization. He was always very grateful. Since you were like family, I imagine you felt sorrow seeing his body deteriorate over time. I probably cried more for this story than any other stories I've done. There were some film producers and editors that I wanted to work with. I showed them [my] footage and they were like, "Oh, this is unusable. There's so much shaking and sobbing in background." That was just me. It was a very emotional experience. Were you there when He attempted suicide? Yeah, I was sleeping in the next room. [His wife] saw something white in her husband's mouth. She thought, "Oh no, what medicine did he take that was bad for him because he's foaming at mouth." He Quangui, moments after he tried to suffocate himself while the rest of the household was asleep. His wife pulled toilet paper out of his nose, a plastic bag out of his mouth and untied his hands which he bound tightly with white cloth. He Quangui had pulled his oxygen tube off and muttered a prayer to the Chinese gods to take him quickly to the other world. Wow. What did he say afterward? He said he wanted to kill himself while I was there. I don't know exactly what he meant by that. It could be two-fold. One was that he kind of was a collaborator in the process, and he understood that I wanted to photograph the entire process of his life. The other was that he felt his wife would be more comforted if I was around because I had become a family member. I suspect he felt his wife would feel more reassured if I was around helping to make the family decisions in the event he died. This wasn't his first attempt at suicide. His life was pretty horrible. The quality of life is pretty low [for those with silicosis]. He had attempted to kill himself many times. Are the Chinese aware of this issue — that so many miners have silicosis? There's generally more awareness of the disease, but I would say there's still a lack of in-depth understanding of what [silicosis] is or what it actually does. Throughout the time I was photographing out there in the villages, I met people who were friends of miners who were silicosis stricken and they would say things to me like, "Oh, aren't you scared of hanging around with him so much and so close?" And I'm like, "No it isn't, it's not contagious. You get it from blasting rock; you don't get it from being close to someone." They have a point in that a lot of patients in the end succumb to tuberculosis, which is highly contagious. But silicosis by itself is not contagious. Does China have laws to protect the health of miners? The regulations were changed in 2011. [China has] become more protective of the workers but, on the ground level, there's still a big gap between what is written in law and what actually happens in practice. There has been some impact in terms of the lobbying done by Chinese NGOs, civil society and journalists, but the implementation remains very weak. So, what has been the reaction in China to these photos and the video? They were published on a major Chinese website called Tencent in May and it went viral. We were able to raise a lot of money for [He] to pay his debts and medical bills and roof repairs — things like that. His son's teacher and school principal — he's in vocational school right now — saw the piece as well and decided to waive his school fees for the next two years. The other dimension of this is that it made silicosis in China a hot topic again. The NGO that works on this issue in China, their phone was ringing off the hook for a couple of weeks. So they got a lot of attention out of this. It was also exhibited in August in a Chinese photo festival, so it's gotten a fair amount of circulation. Is He Quangui still alive? He passed away on the first of August this year, which was a very sad thing. I missed the funeral. I was very torn about the whole thing, but I could not make it back in time. Because it was summer, they couldn't keep the body for too long so they had to bury him very quickly, less than two days after he died. It wasn't suicide. He had just come back from the hospital. It was pretty sudden. Previously he'd had [at different times] a sense of his deterioration and he would say his goodbyes. He would send me a bunch of text messages or we'd talk on the phone and he'd say, "Goodbye, thank you so much for everything you've done." He was always giving thanks and saying goodbye, but this time it was pretty sudden. We were just chatting the day before and his wife told me afterwards. This project was supported by a travel grant from The Pulitzer Center on Crisis Reporting. A previous version of this story included a bracketed note identifying a surgery as a "lung transplant." He Quangui did not have a lung transplant. Also, in the caption for the photo at the top of the post, the original information was incorrect. The doctor is not puncturing He Quangui's lungs; he is puncturing his chest cavity to release air that escaped from his damaged lungs.